Slightly edited and revised version of an article published in The Space Review, Monday, January 30, 2017. Sometimes life is like a movie. Think of the scene when the hero finally finds the lost artifact, after years of searching, hope fading. In that moment, his years of study let him recognize it immediately, no matter how ravaged and incomplete it is. He points out features and fixtures, present or missing, and names them as his fellows approve and agree. That doesn't happen often outside of the movies. It happened to me recently. Sort of. My particular lost artifact was a piece of equipment from a long-cancelled space program. It was not lost as much as it was long neglected, hidden in plain sight in the wrong place as it gradually decayed. Specifically, it is the adapter module of the Gemini-B vehicle designed to carry U.S. Air Force astronauts to and from their tours of duty aboard the Manned Orbiting Laboratory, or MOL, a series of single-use 1960’s-vintage manned spy satellites to keep an eye on America’s Cold War adversaries. It was probably part of a Gemini-B spacecraft engineering mockup from 1968 (Figure 1), with some flight-worthy components and some simulated parts, but intended for ground evaluation instead of flight. The mockup was apparently designated the “ECV” which might have stood for “engineering configuration vehicle” but no one I have asked can confirm that. Figure 1. Gemini-B ECV at McDonnell Douglas in St. Louis ca. 1968. Photo by McDonnell Douglas, courtesy Dr. Dwayne Day. The adapter on Gemini-B and on its cousin, NASA’s Gemini (Figure 2), connected the crew re-entry capsule to the rest of the launch vehicle stack. Gemini’s designers at the McDonnell Aircraft Co. were anxious to minimize weight as much as possible, so they ingeniously used that otherwise wasted volume to accommodate life support equipment, maneuvering systems and experiments needed during flight but not during landing (1, 2). This kept the re-entry capsule’s weight to a minimum without sacrificing in-flight functionality. Figure 2. Comparison of NASA Gemini and USAF Gemini-B for MOL, with sections labeled. Original Art by G. de Chiarra, modified by J. Charles. The “B” version of the Gemini had MOL-unique modifications that distinguished it from NASA’s “A” version (which was never referred to as “Gemini-A” as far as I know.) Among the modifications was a pair of hatches in the aft end of the Gemini and its heat shield that led to a tunnel through the adapter connected to the pressurized module of the MOL. That module, the disingenuously-named “laboratory” in “manned orbiting laboratory,” was the business end of the MOL vehicle, containing the DORIAN KH-10 camera system with its 72-inch diameter mirror. MOL was to be built by the Douglas Aircraft Co. in Huntington Beach, California. I had seen the Gemini-B ECV crew capsule, or re-entry module (Figure 3), on several visits to the National Museum of the U.S. Air Force at Wright-Patterson AFB near Dayton, Ohio, most recently at the October 2015 “MOL declassification event” staged by the National Reconnaissance Office. This was the NRO’s way of announcing the new public accessibility of 825 documents, 282 photographs and one short movie clip on MOL, all previously classified as “secret.” The museum’s Gemini-B was displayed until 2016 as an example of NASA’s Gemini, albeit without its adapter module, its rendezvous and recovery nose section and both of its hatches, and with “U.S. Air Force” and the star-and-bars roundel emblazoned on its flanks. That always seemed like a wasted opportunity to showcase the Gemini-B’s unique characteristics. Then again, maybe deception was appropriate for a top-secret spy satellite. Figure 3. Gemini-B reentry module, possibly the same ECV as in Figure 1, now on display at the National Museum of the U.S. Air Force, Wright-Patterson AFB. Photo credit: Jim Cope, USAF. When I say confidently that this display vehicle is the ECV, it is an act of faith based on deduction. The only known photographs of a vehicle in the Gemini-B configuration are of the ECV in about 1968 at the now-McDonnell Douglas plant in St. Louis, Missouri. No Gemini-B flight vehicles were ever constructed (4), so I assume that the vehicle now on display in Dayton is the ECV. Eventually I mentally connected the Gemini-B adapter module in the USSRC bone yard with the capsule in Dayton, although their physical and geographical separations gave me pause. 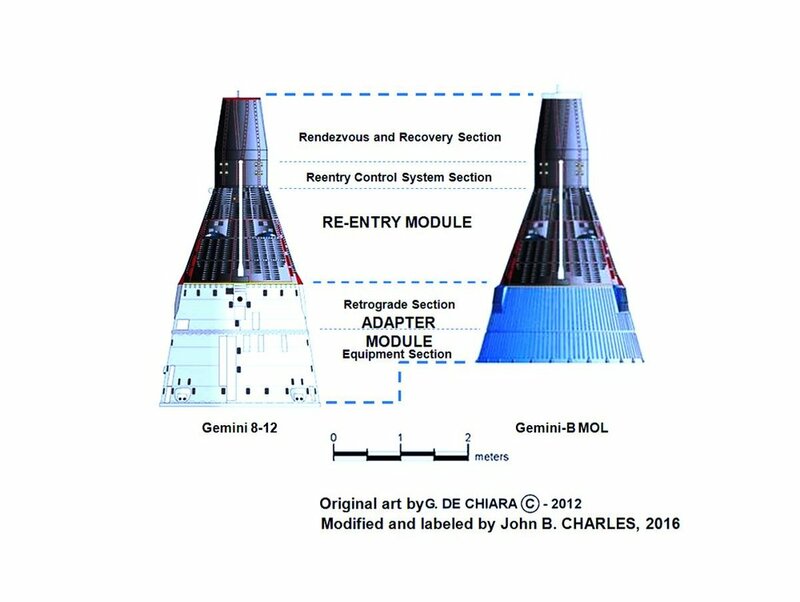 By 1967, McDonnell-Douglas considered the Gemini-B/MOL system to be sufficiently flexible and capable for future space station programs as well as for the secret military missions for which it was originally designed. It was marketed aggressively to NASA for space station use, unsuccessfully. Undaunted, the company decided to compete head-to-head with North American Rockwell’s Apollo command-service module assemblage for space station support. Their concept was the Big Gemini (3), or Big G, which enlarged the carrying capacity of the basic Gemini-B reentry module to accommodate up to 10 more astronauts or their equivalent in cargo by extending its length by 60% (Figure 4). In particular, the removable hatch through the aft pressure bulkhead led not to a tunnel but into the additional crew compartment. Big G never got beyond the mockup stage, but the Big G mockup in St. Louis must have initially used the existing Gemini-B engineering mockup as its basis, without its adapter section and with a modified rendezvous and recovery nose section. Instead of its adapter, it was attached to the extended crew module that made Big G big. However, a photograph of the Big G mockup from April 1969 shows the NASA Gemini, not the Gemini-B. The photo’s caption states clearly that the NASA Gemini is used in the mockup, and the paint job on the side of the capsule confirms it. Perhaps the Gemini-B mockup could not be used for the photo session because it had “U.S. Air Force” painted on its flank (see Figure 2) instead of NASA’s “United States,” poor strategy for marketing to NASA. Figure 3. Big Gemini mockup at McDonnell Douglas in St. Louis, April 1969. At the core of the mockup is the “NASA Gemini,” possibly for marketing purposes, even though the concept required the Air Force MOL Gemini-B variant for it to be usable. Note Gemini-B adapter in background, separated from its Gemini-B re-entry module, which was probably used on this mockup for all work except for publicity photos. Photo by McDonnell Douglas, courtesy Dr. Dwayne Day. Also of note: the Gemini-B adapter module was standing in the background of the Big G photograph, separated from its crew module, which was not in any of the photos. When MOL was cancelled in 1969 and subsequent bids to market the Gemini-B and Big G spacecraft to NASA lost out to Space Shuttle concepts, McDonnell Douglas collected the MOL flight and ground hardware, including the ECV mockup, and either scrapped it or offered it to the Smithsonian Institution. By law, the Smithsonian is the official repository for important government space artifacts and keeps or distributes those it deems representative and important. Somehow, sometime, possibly in the early 1970s, this adapter unit was mixed in among other surplus items that seemed to represent Marshall, so it ended up on a pallet delivered to Huntsville. There it sat. We knew where the adapter was in 2006 because Tom Hancock, a space historian in Huntsville, Alabama, had posted photographs of it on the Internet in his “US Space News” blog (now retired). He occasionally visited it in the outdoor storage area, or “bone yard,” of the U.S. Space and Rocket Center in Huntsville. The USSRC, originally the Alabama Space and Rocket Center, is the visitor center for NASA’s Marshall Space Flight Center, and it is full of mockups, prototypes and spares of spacecraft and their systems from the Apollo, Skylab and Shuttle programs for which Marshall was responsible. This bone yard is like most outdoor storage areas for museums, schools, factories and my grandmother’s farm. Pieces of machinery and other items with no planned use but possible future value sit in the open air, usually grown up in weeds and inhabited by wildlife. The NRO event is also where I first met Mike Jenne, an author whose breakout work is an alternate history trilogy (Blue Gemini, Blue Darker Than Black and Pale Blue, Yucca Publishing, New York, NY) about clandestine Cold War space missions aboard modified Gemini spacecraft. It is carefully researched as well as well-written, and I quickly appreciated Mike’s grasp of the subject matter. So, it was that, on June 29, 2016, eight months after the NRO event, I emailed Mike to see if he would be interested in a MOL-related challenge: reuniting the capsule in Dayton with the adapter in Huntsville, so they could be displayed in Dayton, together for the first time in decades. He accepted the challenge. A few days later, on July 3, Mike drove north from his home near Birmingham to Huntsville to reconnoiter the bone yard. He is retired Special Forces, so he prepared for this mission by looking at overhead imagery of the bone yard from Bing and Google Earth. Based on his research for the trilogy, no one could have been better prepared for this quest. Actually, it was multiple quests: others in his network of space history buffs had suggested their own favorite space artifacts as targets, so he had a shopping list. After his visit, Mike emailed that he hadn't been able to find the adapter. The closest he came was a fiberglass cylinder over near the Titan II ICBM display model, but with none of the expected internal features, especially the crew transfer tunnel, and larger than the 10-foot diameter of the Titan rocket which was to be MOL’s launcher. That was discouraging, but I began to accept that it was gone, scrapped or otherwise disposed of, or dissolved unrecognizably into the weeds and dirt. However, Mike is more persistent than me. A couple of days later, on July 5, as he searched through the overhead photos again, he spotted an inconspicuous cylindrical item that he had seen but dismissed during the visit. I sent him Hancock’s pictures from 2006 and told him the adapter is a tapered cylinder 10 feet across at its wide end, 7 feet at its narrow end, and 5 feet high. When I confirmed it was probably gray, unlike the white Gemini adapter he had been looking for (oops, did I not mention that difference before? ), he was convinced this was the missing item. The adapter is barely recognizable in the low-resolution Google Earth image from October 29, 2015 (Figure 5), sitting sixteen feet southeast of a storage building at the western end of the USSRC complex: look for it at 34 degrees, 42 minutes, 35.38 seconds north, 86 degrees, 39 minutes, 32.49 seconds west. Figure 5. Google Earth view of USSRC bone yard dated Oct. 29, 2015, showing location of Gemini-B adapter module. Screen capture by J. Charles from Google Earth. Coincidentally, Hancock reposted some of his 2006 images on the Space Modeling page on Facebook on that same day (5), reinvigorating public interest in the item. Mike returned to the bone yard on July 17, two weeks after his first visit, and went straight to the artifact. It was as if I were there, too, because he sent me pictures from every angle as he inspected it (Figures 6 and 7). It was surprisingly recognizable after having been exposed to the elements for at least a decade and probably much longer. Figure 6. Current location and condition of Gemini-B adapter module at USSRC bone yard. Photo by Mike Jenne, July 17, 2016. Figure 7. Detail of Gemini-B adapter module showing crew transfer tunnel (top) and retrorocket assembly (bottom) with five of the six original simulated retro rockets still in place. Photo by Mike Jenne, July 17, 2016. How much longer is not clear. Available imagery does not show where it was when Hancock photographed it in 2006, but something that resembles it was sixty feet further to the south, across an access road, from 2007 to 2013. And there the story might have ended, except for a whim. My wife and I have been discussing a post-retirement plan to buy a recreational vehicle and use it to see the country affordably. We decided to “practice” retirement this year on a week-long road trip in a rented RV. Driving from Houston to Huntsville would provide the needed distance and scenery, so I asked Mike if he was up for another trip to the bone yard. He was, and recruited two friends in Huntsville to meet us there. One of them was Tom Hancock, who had taken the very photos that had inspired our search. We were escorted by Ed Stewart, Director of Exhibits and Curation. That is how, on the sweltering sunny morning of August 24, I found myself in the USSRC bone yard with four other space history buffs approaching the adapter. It wasn't a profound or moving experience but it was gratifying to see it for myself and to imagine it as it once was. I immediately recognized the vestiges of the simulated retrorockets, the crew transfer tunnel, and the empty fixtures for the oxygen and water tanks. We searched for data plates on every piece and established that most of it had been built by October 1967—49 years ago. With the USSRC curator, we immediately started scheming how to rescue it from the elements, refurbish it and put it on display somewhere. All those steps would require funding as well as a destination, although the curator said he would try to move it indoors in the mean time. The USSRC never had any connection to MOL—aside from this adapter’s unexpected and unrequested delivery—so the problem also included shipping it somewhere else that did have a connection. The obvious “somewhere else” is the National Museum of the U.S. Air Force at Wright-Patterson Air Force Base in Dayton, Ohio. The museum’s Gemini-B crew capsule was, I believe, originally paired with the adapter module now at USSRC as the complete ECV of 1968. Thus, it makes sense that they should be reunited and displayed there among the museum’s unique collection of unmanned reconnaissance satellites. However, here is where the realities of museum operations complicate matters. First, the adapter is officially the property of USSRC, and they would have to transfer it. This part sounds easy, because the USSRC curator said he would support such a decision. Second, as John Luchin, Registrar of the Collection Management Division, explained, the NMUSAF establishes its restoration and exhibit projects and budget years in advance, so even if they acquired the adapter, it could sit in storage for years. Storing it indoors at the Air Force museum in Dayton seems preferable to leaving it outdoors at the NASA museum in Huntsville, and not just because of the ravages of nature. There is apparently also larceny involved. One of the six simulated retrorockets is missing, and Hancock recalls an earlier visit to the artifact when all six were present. On the day that Mike took pictures of it at USSRC, a security guard told him that the USSRC had experienced problems with people raiding the bone yard for scrap metal, particularly aluminum. If anyone suspected the market for these and other rare historical artifacts—perhaps a collector wanting something to go with his purloined simulated retrorocket—then four men and a pickup truck could bring our story to an untimely end. At least such a collector would recognize the significance of the MOL program. Even if we considered it a failure because it was cancelled before its first flight, MOL was a massive undertaking in which thousands of workers labored and billions of taxpayer dollars were expended. The Air Force press release announcing its cancellation said that “about $1.3 billion had been spent to date” on MOL, equivalent to $9.4 billion in 2015. Despite that mind-boggling investment, there are few MOL artifacts remaining. In addition to the intact mockup crew capsule at the NMUSAF, the less-intact mockup adapter module at the USSRC, there are six 72-inch diameter mirrors used in the Multi-Mirror Telescope, Mt. Hopkins, Arizona, 1979-1999, at least five blue Hamilton-Standard spacesuits, three buildings at the Douglas, then McDonnell Douglas, now Boeing plant in California, a re-purposed launch pad in California now used for commercial launches, a building at the Air Force’s mission control center, also in California, a flown heat shield test capsule in Florida, and an alligator clip-lined aluminum sheet at the NMUSAF labeled a “prototype food dispenser for the Manned Orbiting Laboratory, one of the very few full-scale objects to survive the MOL project…” The scarcity of physical artifacts associated with the MOL program would seem to be adequate motivation to properly preserve this piece of history. It is clear that any progress will require coordination and collaboration at high levels. The first step might be to identify who those high-level decision-makers are so they can specify the steps required at USSRC and NMUSAF to effect the transfer: who has approval authority, what has to be approved, in what order, for which options (restore, refurbish, display as is or other option) and most importantly what it would cost. Presumably items are shared among museums all the time, so how has it been done before? If it isn't on their multi-year plan, what would it take to get it into that plan? Whatever fate the future holds for the adapter, I think it was appropriate and not at all ironic that we pinpointed this artifact—a vestige of a high altitude photographic spy program—by examining high altitude photographs of the target area. That’s the kind of closure that you usually only get in the movies. John Charles is a senior space life sciences manager for NASA in Houston with a life-long interest in spaceflight and particularly in MOL. Suggestions on ways to reunite the wayward adapter with its crew capsule are welcome in the comments and at jbcharle@gmail.com. (1) Grimwood, James M., and Hacker, Barton C., with Vorzimmer, Peter J, Project Gemini, Technology and Operations, A Chronology, NASA Special Publication-4002, Washington, D.C.: NASA, 1968, http://history.nasa.gov/SP-4002/p1a.htm (accessed Dec. 24, 2016). See entries for July 7 and July 27-28, 1961, in PART I (A), Concept and Design, April 1959 through December 1961. (2) Kolcum, Edward H., “Manned Space Flight Program Expanded; McDonnell to build 12 two-man capsules and modify four Mercury spacecraft for flights of 18 orbits,” Aviation Week & Space Technology, Dec. 18, 1961, pp. 26-7, http://archive.aviationweek.com/search?exactphrase=true&QueryTerm=%26quot%3Bmercury+atlas+6%26quot%3B&start=120&rows=20&DocType=Article&Sort=date&SortOrder=asc&startdate=1916-08-01&enddate=2016-12-26&LastViewIssueKey=&LastViewPage= (accessed Jan. 1, 2017; subscription required). (3) Petty, Chris B, “Space Trucks! Big G and the TKS,” The High Frontier (blog), Dec. 14, 2015, https://thehighfrontier.blog/2015/12/14/space-trucks-big-g-and-the-tks/ (accessed Dec. 25, 2016); Day, Dwayne, “The Big G,” The Space Review, Dec. 7, 2015, http://www.thespacereview.com/article/2879/1 (accessed Dec. 25, 2016). (4) “Program Schedule Status, 10 June 1969,” http://www.nro.gov/foia/declass/mol/746.pdf (accessed Jan. 9, 2017), pp. 22 of 41, item IV. (5) Hancock, Thomas, Facebook post, July 5, 2016, https://www.facebook.com/search/top/?q=Space%20Modeling%20mol (accessed Dec. 26, 2016). I recently spent an entertaining hour and a half at a “wet shave meet-up” speaking about NASA space biomedical research in general and shaving in space in particular. That sentence begs at least two separate explanations. First, a wet shave meet-up is not a variation on Sir Arthur Conan Doyle’s “The Red-Headed League.” I didn't know it but wet-shave meet-ups are a national phenomenon where aficionados, enthusiasts and artisans can buy, sell and discuss blades, brushes, sharpeners, etc. It sounds a little crazy but there is actually a community of wet shaving aficionados who enjoy shaving with a razor and related tools as opposed to an electric razor. “Wet Shave Meet Ups” is a resource page (1) put together by Doug Smythe and Matthew Broderick to keep the community informed. Individual meet ups are organized by people in the community when and where the spirit moves them. The “mother ship” of meet ups was held April 23 in Pasadena, California: “Big Shave West” (see it at “The Heart of Shaving: Big Shave West 2”) (2). It had about 250 men and women in attendance, including manufacturers, YouTube “celebrities” and just-plain-fans from all parts of the globe. I didn’t go to Pasadena, California, or even Pasadena, Texas. The Space City Meet where I spoke was organized by Adam Lindberg, artisan soapmaker for Stubble Trouble in Houston, a local meet-up at Rosewater, a new bar here in Clear Lake, Texas, co-owned by Pasha Morshedi, a colleague at NASA, and coincidentally where Adam is a bartender. There were about 30 wet shaving fans in attendance from as far away as Boston, along with manufacturers of small batch shaving products. It was organized by Gail Wells, the US brand manager for Edwin Jagger, an English company (3). She asked me to speak about shaving and grooming in space, and anything else of interest to the group. This talk was arranged through the Johnson Space Center Speakers Bureau (4) so I had planned to give my usual 60-plus slide presentation on NASA’s Human Research Program and our work on resolving the risks to astronauts on future deep-space exploration missions, with a few interstitial slides on the history of shaving in spaceflight. Technical problems spared the attendees my full presentation, but luckily the shaving part could be retrieved. Being a NASA scientist, I use PowerPoint for all my presentations. The figures in this article are most of the charts I used at the meet up. Their text reveals the maturation of my approach to this topic. Second, and contrary to my wife’s expressed disbelief, there is actually at least 30 minutes’ worth of presentation material on the topic of shaving in spaceflight. I was substituting for Neal Pellis who wasn’t available, but leaped at the excuse to explore this little appreciated aspect of everyday life in human spaceflight. When I said “yes,” I already knew a few facts (remember: I'm a space geek): the first in-flight shaving was done on Apollo 10; Frank Borman requested an electric razor be waiting for him on the recovery helicopter after Apollo 8; some of the Skylab astronauts grew bushy beards while in orbit. But I had about three weeks to do some more research, so the first thing I did was contact some astronauts I know and ask them about wet shaving in flight. They responded almost apologetically that they used the electric shaver but without the vacuum attachment that featured in early designs. Instead, they just shaved near the inlet of the air conditioning system and let the spacecraft’s filters catch their whiskers. 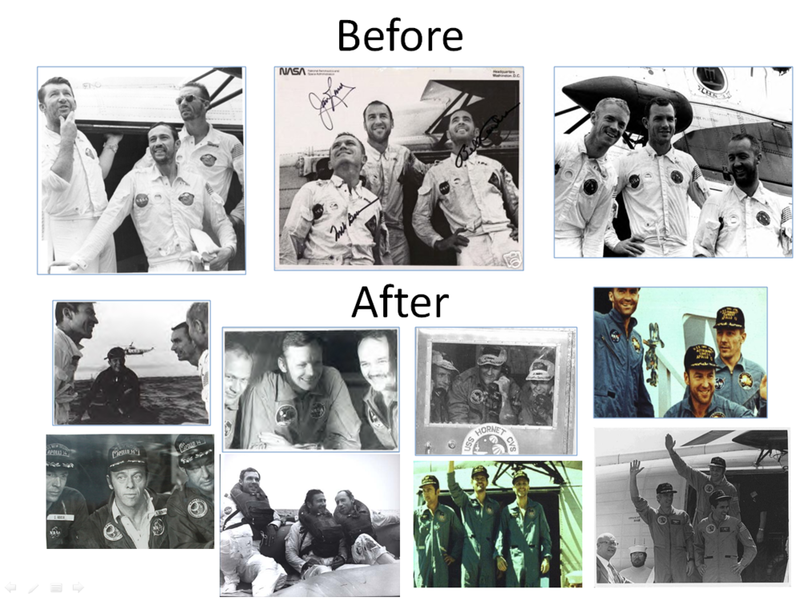 If you are old like me, you remember the bearded faces of pioneering astronauts, beaming but exhausted, on the aircraft carrier after splashdown. In particular, the men on NASA’s second, third and fourth Gemini missions in 1965 extended our experience base of manned spaceflight stepwise to four, then eight and finally 14 days (figures 1), demonstrating that astronauts could come through the planned duration of the upcoming Apollo lunar landing missions with no debilitating physical effects. (The longest of seven previous American flights was 34 hours and the average was just under eight and a half hours.) Their beards confirmed what we already understood: that they had returned from the frontier, at no small risk to their lives and health, and had pushed back the boundary of the unknown just a little bit farther in man’s conquest of space, and in particular, America’s race to beat the Soviet Union to the moon. The early astronauts didn’t shave in space because they couldn’t, not because they didn’t want to. It wasn’t considered a priority in a program that was just trying to prove that man and machine could function long enough to get to the moon and back. By 1964, however, electric shavers were in development for future longer flights (figure 2A, right picture) that included a cumbersome vacuum hose to collect the cut whiskers (5) so they would not be a health hazard or contaminate the electronics (figure 2B), but they were not yet ready to fly (6). Wet shaving was unthinkable: free-floating water droplets were considered anathema by engineers who remembered the problems caused to spacecraft electronics by Gordon Cooper’s body moisture during his 34-hour Mercury flight just two years earlier. There was no lack of desire to shave. Setting aside matters of comfort and hygiene, some astronauts also were sensitive about appearances. Jim McDivitt on the four-day Gemini 4 and Jim Lovell on the 14-day Gemini 7 had grown unmistakable beards. Frank Borman, also on Gemini 7, hinted at his uneasiness in comparison when he wrote in his biography that “Lovell had a full beard and I looked like a skid row bum recovering from a week-long binge.” (6) When Borman he flew with Lovell again, this time on Apollo 8, he made sure there was an electric razor waiting for him in the recovery helicopter (7)--which apparently only he used (figure 3). The breakthrough came in May 1969 aboard Apollo 10, the last mission before the lunar landing. First John Young, then Tom Stafford and Gene Cernan, homeward bound and taking advantage of the hot water available on the Apollo command module (9) advised Mission Control they were performing scientific experiment “Sierra-Hotel-Alfa-Victor-Echo” (figure 4). This transparent code-name was their light-hearted effort to let friends and family but not the press know that, thanks to brushless shaving cream and a safety razor, they would emerge from their spacecraft clean shaven after their eight-day mission. But the difference was noticeable in their last color TV broadcast before splashdown, so the secret was out. Despite the original concerns it was found that using brushless shaving cream and safety razors there was actually no problem with loose whiskers. The process of shaving was still far from easy - most crews reported that the razors quickly became clogged with used shaving cream and whiskers and were almost impossible to clean out in the absence of running water. The brushless shaving creams used by the astronauts were regular commercial products and the crews were apparently free to choose the brand they wanted to carry with them on a particular flight. Once it was established as an option, wet shaving even allowed Mike Collins on Apollo 11 to express himself creatively (figure 5). The preflight press information kits for the pre-shaving Apollos 7, 8 and 9 and the post-shaving Apollos 10, 11, 12, 13, 14 and 16 (10) shows they all list the personal hygiene items carried on each spacecraft: toothbrushes and toothpaste, tissues, solid waste collection bags and urine collection devices. However, none of them lists any devices for either wet or dry shaving, not even on those missions where shaving was known to occur. The relevant text was obviously copied from one press kit to the next, but it is hard to understand why such intimate activities as tooth-brushing, urination and defecation were acknowledged publicly but shaving was not. The Apollo Stowage Lists make no mention of the shaving equipment carried by the crews, but we do know that Apollo 11 Command Module Pilot Mike Collins used Old Spice brushless shaving cream on that flight as it is now part of the Smithsonian collection [along with his Gillette Techmatic safety razor (figure 6)]. We also know that a tube of K-34 Gillette brushless shave cream was used by the crew of Apollo 12, as this was given by them to Support Crew member Paul Weitz as a memento after the flight. On Apollo 13 we know that they used a shaving cream by Mennen, as this is mentioned in the technical debriefing. However, a wind-up mechanical razor was available by the time Apollo 14 flew in early 1971. It was even featured in a well-acted in-flight skit in which Alan Shepard shaved with it (12) then appeared to order his reluctant crewmate Ed Mitchell to do likewise (figure 7). (I made figure 7 from YouTube via a screen capture but cannot now find the video again.) Their razor looked very much like the unflown prototype intended for the Skylab space station in 1973 (see figure 2A, left side) except with a black body. [a]lthough safety razors were found to work reasonably well in a weightless environment the evaluation of mechanical razors for use in space continued. These efforts led to the adoption of a wind-up mechanical design made from acrylic which was used for the first time on Apollo 14 with reasonable success. On Apollo 16 Ken Mattingly used a mechanical razor and found it worked well if used frequently. If used on two day old stubble however, he reported that it felt like the whiskers were being pulled out rather than cut. His crewmates apparently used Wilkinson safety razors when they had to shave, but found the same problem with clogging blades as earlier crews. Thus, with both a wet and a dry option available, the difference was like night and day. All previous crews were scruffy if not shaggy, and all subsequent crews looked more “kempt” (figure 9)…except for Apollo 13, who did not shave before splashdown, lacking both the warm water and the inclination to do so while they struggled with their crippled spacecraft. [t]he first long duration Gemini spaceflights [Gemini 4, 5 and 7] brought the issue of shaving in space to the fore. The main concern was to ensure that loose whiskers would not end up floating into critical flight instrumentation, but early experiments with electric shavers fitted with simple vacuum attachments were a failure. On Gemini [presumably after Gemini 7] through Apollo, the crews were issued with Gillette Techmatic safety razors but they apparently went unused until the flight of Apollo 10. Unfortunately, this is hard to square with Borman’s request for an electric shaver in the helicopter: why didn’t he just shave in flight instead? Presumably, any razor and cream that flew on Gemini was manifested only after its longest-duration mission, Borman and Lovell’s Gemini 7, or Borman would have shaved during that flight as well. Unless, that is, he didn’t relish cold-water shaving: Gemini did not provide hot water. At the risk of contradicting Chris Spain (whose web article did not give a source for the presence of inflight shaving paraphernalia prior to Apollo 10), it only makes sense to me that the Apollo 10 astronauts were the first to shave in spaceflight because they were the first to be equipped to shave in spaceflight. Apollos 7, 8 and 9 also had hot water, plus lots of relatively idle hours toward the ends of those missions. Admittedly, it would have been more tedious to shave a week-old beard under those conditions, but not impossible. Wet shaving has continued to be a part of subsequent missions, programs and eras (figure 9), as demonstrated by Joe Engle on STS-2 in 1981 and Mike Mullane on STS 41-D in 1984. I don’t know how the post-Apollo practitioners solved the problem of clogged razors, however, in the absence of freely-running water. Interestingly, the inability or even reluctance to shave was not just a feature of American spaceflights: no Russian cosmonauts shaved in space until 1974, five years after the Americans. My colleagues Anna Kussmaul and Yuri Smirnov of the Institute of Biomedical Problems of the Russian Academy of Sciences in Moscow told me about the history of shaving on their flights. In 1966 the Russians were preparing a series of Voskhod missions to exceed the Americans’ recent accomplishments in Gemini, including the planned 18-day flight of Voskhod 3 to break the 14-day record of Borman and Lovell on Gemini 7 (13). (The longest previous Russian mission was five days, and the average of the eight was just over two days.) One record the Russians apparently did not intend to establish was the first shave in space: Voskhod 3 cosmonaut Boris Volynov asked his boss, Gen. Nikolai Kamanin, for permission not to shave in flight, so Kamanin ordered that no shavers be flown (14). (This was about two months before planned launch, but sometimes things get overlooked until too late.) Voskhod 3 and its follow-ons were cancelled a few months later and Volynov didn’t fly until an early next-generation Soyuz mission in 1969. In 1970 the Soyuz 9 crew flew for 18 days, taking back the endurance record. In 1971 the Soyuz 11 crew lived and worked aboard the first space station, Salyut, for 24 days--and apparently did not shave (figure 10A). But their appearance may have impressed space managers because that same year the Ufa factory received an order to create the first electric shaver for spaceflight (15). Three missions later, the Soyuz 14 crew tested the Agidel-K electric shaver (figure 10B), with vacuum attachment (not shown), during their two-week stay on Salyut 3. The first confirmatory photo I could find shows the Soyuz 18 crew clean-shaven after their 63-day flight aboard Salyut 4 in 1975 (figure 10C). I still don't know when the Russians adopted wet shaving in flight, but they do it today. Despite the difficulties, which led many astronauts to let their beards grow for at least part of the missions, most reported that it felt very refreshing when they did manage to shave. In the American space program, starting in 1965, new cadres of astronauts were selected who were not military pilots. The scientist astronauts of 1965 and 1967 including university professors with more relaxed and contemporary tastes in facial hair. The first to launch and land with facial hair was Owen Garriott, whose mustache only got longer during his 59 days in orbit during the Skylab 2 mission in 1973 (figure 11). Many subsequent astronauts have sported mustaches throughout their spaceflight careers. The very next crew all launched clean-shaven, but during their 84-day Skylab 3 flight, Gerry Carr and Bill Pogue both grew substantial beards (figure 12), confident that they would not be mistaken for hippies. The first man to launch with a full beard was Paul Scully-Power, an Australian-born payload specialist (e.g., visiting astronaut). He and six crewmates spent eight days orbiting Earth aboard the Space Shuttle Challenger during the STS 41-G mission in October 1984. His experience is notable because he was under some pressure to shave before flight to ensure the face seal of his helmet would function correctly during an emergency. Instead, he demonstrated that it sealed adequately despite his beard (figure 13). Two more fully-bearded men have followed Scully-Power's example: payload specialist Loren Acton on STS 51-F/Spacelab-2 in 1985 and Reinhard Furrer, a German payload specialist on STS 51-A/Spacelab-D1 also in 1985). (American astronaut Ron McNair had a beard when he was selected as a NASA astronaut in 1978, but by the time he flew on STS 41-B in 1984, he was clean-shaven.) The problematic style of helmet was superseded after the first 25 Shuttle flights, and subsequent helmets were indifferent to beards, but I can recall no other fully bearded men who have flown in space since then. Today, both wet- and dry-shaving continue to find adherents aboard the International Space Station (figure 14), as demonstrated in 2000 by Yuri Gidzenko and Sergei Krikalev on the first ISS crew and Yuri Usachev on the second crew. Shaving is now a standard part of routine hygiene for astronauts and cosmonauts, a normal activity of daily living, as it will be as long as men fly in space, the foundation having been laid in this area, as in so many others, by their predecessors decades earlier. (1) Wet Shave Meet Ups resource page, http://shavemeetups.com (accessed Aug. 14, 2016). (2) "The Heart of Shaving: Big Shave West 2," https://youtu.be/LA3JpvoLg4Q (accessed Aug. 14, 2016). (5) “Living in Space,” NASA Facts, NF-27 (Revised 4/69). (6) Borman, F., with R.J. Serling, Countdown, William Morrow and Co., New York, 1988, p. 219. Borman reported a value of $5,000 for the unsuccessful development effort, or $38,000 in 2016 (http://www.in2013dollars.com), which would probably have paid for only a very small developmental effort and no flight-qualified hardware. (9) SM2A-03-Block II-(1) Apollo Operations Handbook, 15 April 1969, Systems Data, Sec. 2, Subsection 2.7, Environmental Control System (ECS), 2.7.1 Introduction, p. 2.7-5, http://history.nasa.gov/afj/aoh/aoh-v1-2-07-ecs.pdf (accessed Aug. 7, 2016). (10) Spain, C., “Space Flown Artifacts,” http://spaceflownartifacts.com/index.html, 2009 (accessed Aug. 6, 2016). (11) Godwin, R., ed., The NASA Mission Reports series, Apogee Books, Toronto, 2000-2002. (12) Framepool, Apollo 14 / NASA / Crew / Space Capsule / 1971, http://footage.framepool.com/en/shot/871923320-alan-shepard-shaving-apollo-14-commando-module (accessed August 12, 2016). (13) Siddiqi, A., Challenge to Apollo (SP-2000-4408), NASA, Washington, D.C., 2008, p. 522, http://history.nasa.gov/SP-4408pt1.pdf (accessed Aug. 19, 2016). (14) Kamanin, N., Hidden Space (Russian: Skritiy kosmos), diary entry for March 21, 1966, http://www.universalinternetlibrary.ru/book/44677/ogl.shtml (accessed August 16, 2016). (15) Space reliability, http://www.tdavitron.ru/home/history/47 (accessed Aug. 16, 2016). The National Reconnaissance Office (NRO) declassified and released 825 documents spanning the history of the Manned Orbiting Laboratory (MOL) program for a public gathering of MOL pilots, managers, historians, and fans at the National Museum of the US Air Force in October 2015. One of the most informative is number 521 in the NRO list, the MOL Flight Test and Operations Plan, dated May 8, 1968. Its 523 pages give a detailed overview of the MOL flight program, including management organizational structure, flight objectives, and ground support. It is a snapshot of planning for MOL three years before the scheduled date of the first launch, and describes a maturing—but not yet mature—program. Click here to read the article published on-line in The Space Review, January 11, 2016.